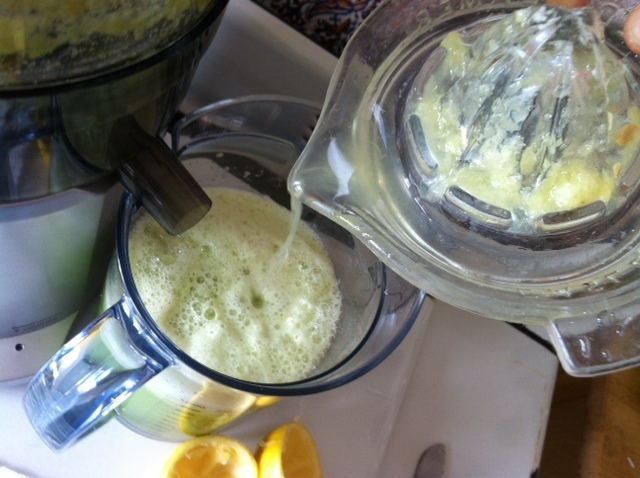 Juicing, being a new Life of a Yogi initiate, and the path to self knowledge. I am working on pratyahara, or control of the senses. To that end I recently gave up all alcohol, in any form, at any time. Next will be caffeine and sweets. I found if I practice discipline of the senses in one area it supports me in others. I also consider myself as ‘always a new student’. I do this not only to protect myself from the idea that I already ‘Know’ something, but also because I am constantly straying off the path. The path of doing what I know to do, those actions my guru tells me will bring me further in my journey to self knowledge. What I mean by straying is that I eat foods I have a commitment not to eat, (dairy), I eat more than my body needs, and I eat without mindfulness. As a result my astral channels get clouded, my liver, kidneys and body have to work harder on waste removal instead of healing or strengthening, and without mindfulness I lose my compassion for those who are starving for even one bite of good food. When it comes to juicing many people know that juicing is good for you and yet not that many people do it as part of their everyday routine. I certainly do not. 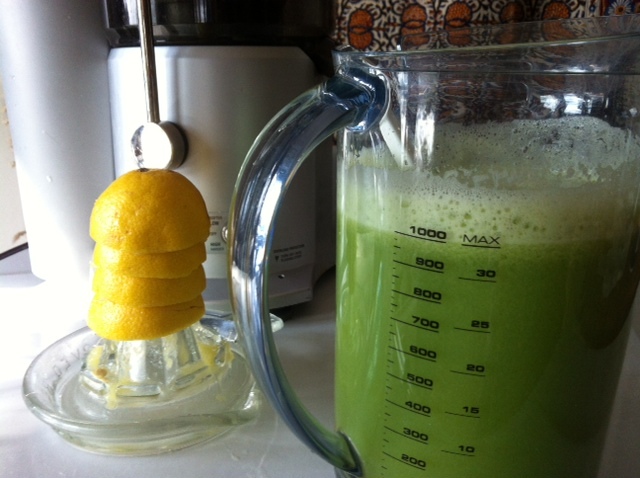 I have a nice juicer, money to buy organic produce and good intentions yet I have to admit that I do not use it everyday. What a mistake. Raw green juice especially sends a particular message to the body, which in turns sends one to the mind, if only I would listen! 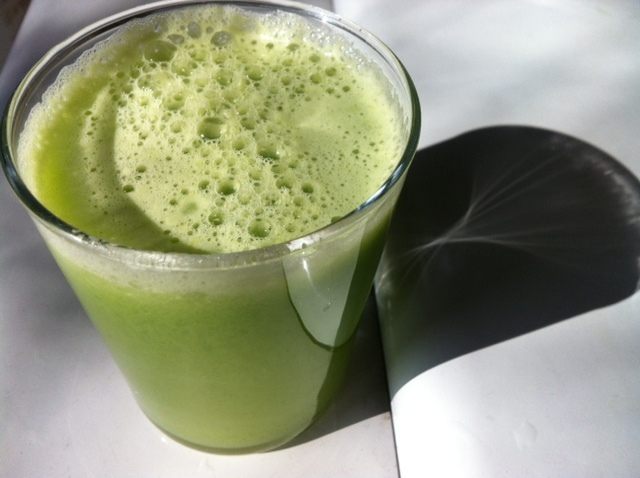 The message the green juice sends me is this: clear, clean, vital, light. If I listen further, by body tells me there is no need for caffeine, skipping a meal is a break for the body not a burden, live food/juice will not slow me down the way dead foods take my energy for digestion, to name a few. Further to this, the very act of juicing because I know it is the right thing to do, because it is an act that is congruent with the path I have chosen for myself, my health and my life as a Yogi, reaffirms everything I believe in. Doing this my practice of pratyahara becomes stronger, my vitality is greater, and the juice purifies my intestine and my astral channels. Clearer and lighter, my steps become firmer. It is all one. Salt for water to wash veggies optional. 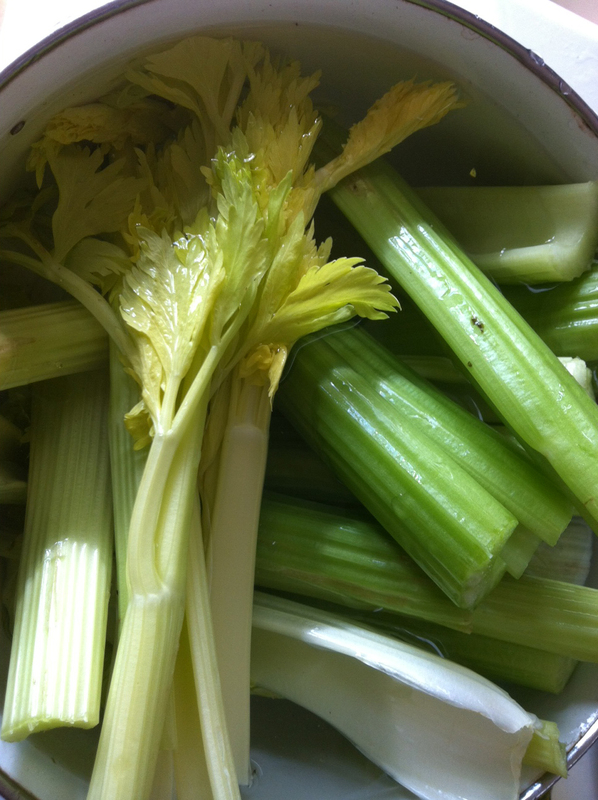 Wash celery stalk by stalk in salted or ‘veggie wash’ water. Rinse well. Peel cucumber if not organic, otherwise it is a matter of taste. 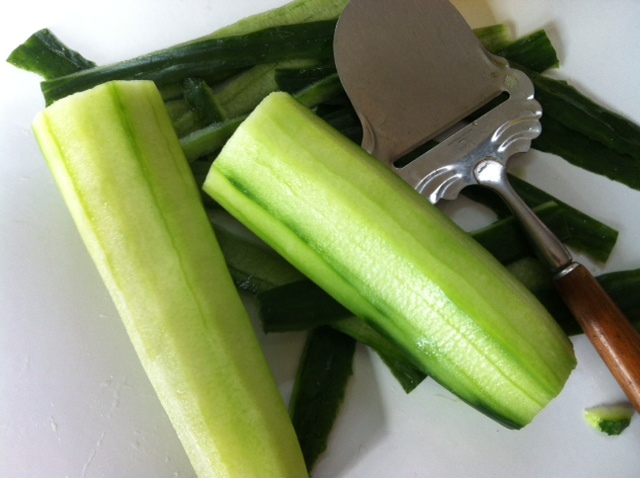 Cucumber peels are generally bitter and may not be that good to consume. The color of this juice is amazing, the taste is even better. otherwise better to take only the juice. 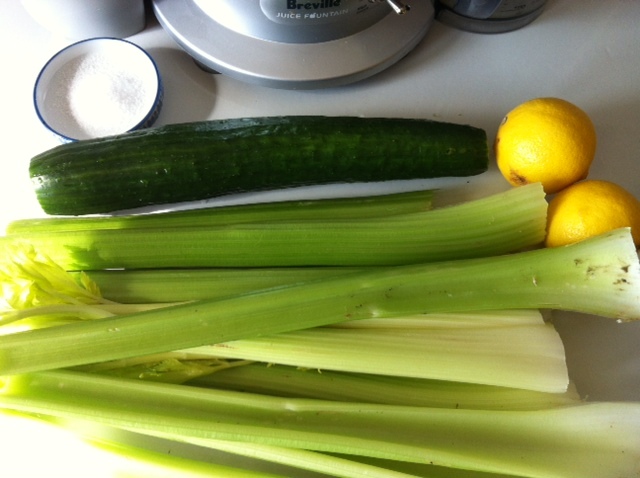 If you started with one whole large celery bunch and a large cucumber you will have about 36 oz of juice. Drink immediately while the enzymes are still living. Give thanks before drinking! 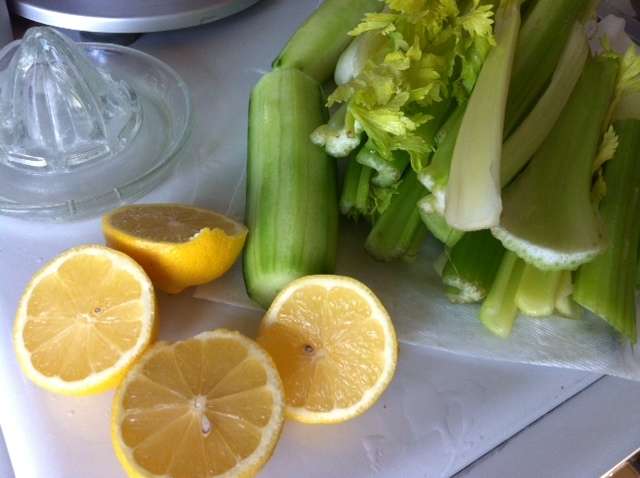 This entry was posted in Juicing, Practising Yoga, RECIPES - ALL, Restoring health, VEGAN and tagged juicing, Purification, raw food, restoring health, vegan recipes, vitality, yoga diet. Bookmark the permalink.